This is sort of like a challenge for me. A customer requested for a cab wrap ala Eni's Square Cab Ring but it has to be adjustable ala Louise's woven wave bypass ring. Was not sure whether I can do it or not but I gave it a try last night and Yippi! its possible. 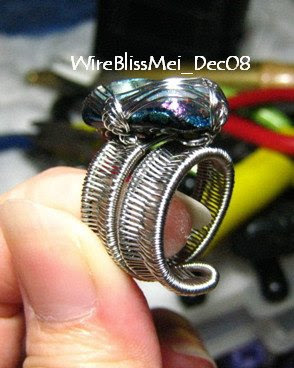 As can be seen here, the square bead is wrapped according to Eni's Square Cab Ring method while the shank is according to Louise's adjustable woven ring method. It was not easy but it is possible. Planning to make another one again. 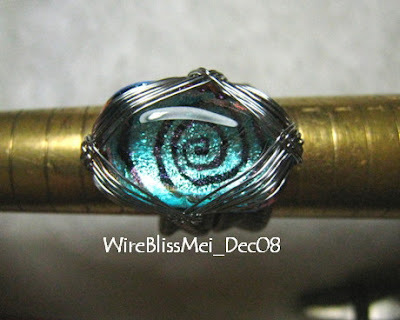 Labels: Rings , Wire Jewelry , Wire Weaving | Knotting Share it! 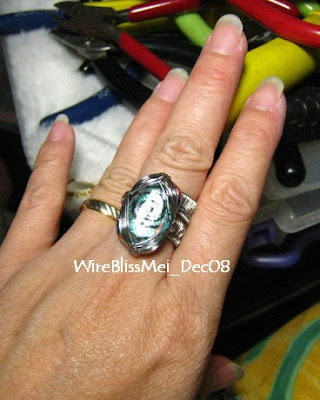 That is gorgeous craftsmanship you did with the ring. Absolutely beautiful. Very beautiful, Mei. I am glad you were able to complete it. Mei - I love the way you made it all your own! Your work is always amazing, and this is just another gorgeous piece! It's a beautiful blending of those two ideas to create something that's uniquely yours - I really like it. Congratulations. Wow, Mei, very inventive and gorgeous! Been a bit behind on this. Sometimes I got distracted and forgot to come back and check on the comments. However, I do take note of your comments and appreciate them very much. Must learn to respond immediately :) Is that a new year resolution? LOL! the first one for year 2009.